The doctor gave me a sheet of paper with a summary table of the calories from different foods. The message I got was that I should control the amount of calories I was eating. It’s a nice doctor, but he has no idea about nutrition, obviously. Anyway, I started to eat less, again. I also increased the amount of exercise I was doing, spending at least half an hour every day in the exercise bike. Instinctively I eliminated bread and pasta from my diet and I started eating very little, about 1200 Calories/day. I was often hungry, but I have willpower. I used fatsecret.es to control what I was eating. It is a free page where you write down what you eat and it tells you how many total calories, carbohydrates, protein and fat you are consuming. Now I think it was a mistake to eat so little, but I was desperate to lose weight and did not know what else to do. I lost a few kilos but after about three months I reached a plateu. I had stalled and I was eating only 1200 Calories/day! So I thought that as soon as I ate a normal amount of food, around 1700-2000 calories, I would recover all the lost weight (no doubt I would have). I was scared and I started reading articles on the Internet about the rebound effect, looking for a way to avoid it. I found nothing useful. I’m not sure how it was but I ended up reading (and watching videos) about low-carbohydrate diets: Atkins diet, Gary Taubes, Peter Attia, etc. I decided then to follow a diet low in carbohydrates. Supposedly it wasn’t necessary to count Calories, but I did not trust much that idea and I kept counting them and keeping them in the 1300-1700 range. That was about day 100 since I had begun to lose weight and I had already lost 10kg. Then I did the induction phase of the Atkins diet, based on what I had learned on the internet (I did not buy any book). 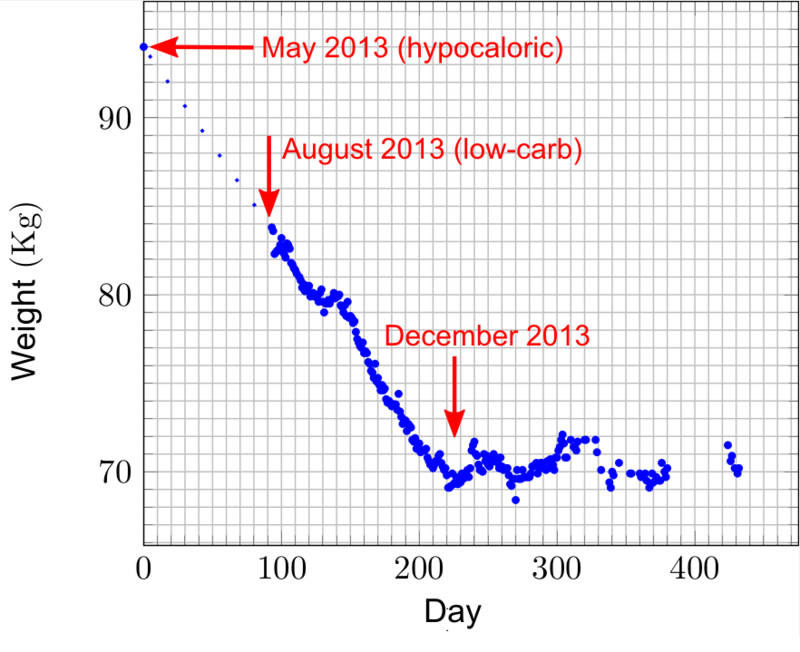 During those two weeks I reduced my carb intake to a minimum. I kept controlling what I ate and my weight responded, as you can see in the graph above. My weight did not go down too fast (between half a kilo and a kilo per week, I think) and I occasionally reached plateaus, but they disappear after a few days. I weighed every day and wrote down my weight on a spreadsheet and fatsecret.es. Although my first goal was 76Kg (from the initial 94), when I reached 76 I changed my mind and wanted to go to 72. Upon reaching 72Kg, I changed my mind again and I set 70Kg as the new goal. I reached 69Kg, but in a few days I returned to 70Kg. Since then I have never stopped eating low-carb, counting calories the first weeks but I stopped counting. I don’t exercise as much as before. I stay in the range of 70-71Kg, I do not starve and I’m better than ever (in all senses). My current carbohydrate intake is limited to daily intake of probiotics (kefir) and salad vegetables, and a piece of pepper, broccoli, brussels sprouts, etc.. now and then. I barely eat fruit and I avoid anything that contains gluten. Of course no pasta, bread or potatoes. My transaminases are perfect (my fatty liver is gone) and stopped taking medication for my GERD. After dropping the medication for the reflux I started sleeping on an inclined bed, but I also stopped doing that because I no longer have GERD symptoms. It is amazing because I do (or did) have a hiatal hernia. My ferritin levels are still high, that has not changed. My last blood test gives a triglycerides/HDL ratio of 0.7. My lipid profile is fantastic in general.